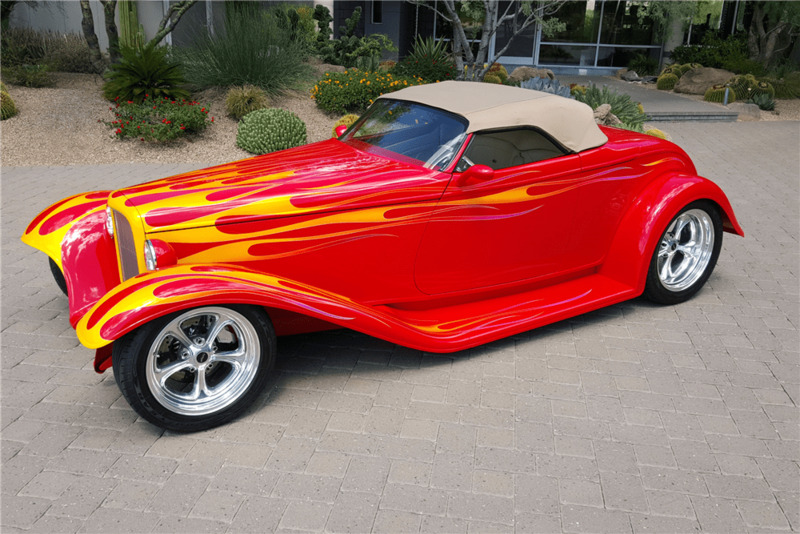 Based on the Boydster II show car designed by Chip Foose, initial build started by Boyd Coddington, custom completion by Chris Tietge’s Hot Rod Garage, including one-off custom hidden soft-top. Absolute best of everything, from custom pearl frames by Wade Hughes/Ohio Flames to the fully chromed/polished Ram Jet 502 with ZF 6-speed transmission. All same until a one-off custom tan folding/hidden soft-top with stainless-steel bows. The straight body is covered in a thick coat of vivid GM Torch Red topped by a custom pearl flame job; no waves or imperfections. 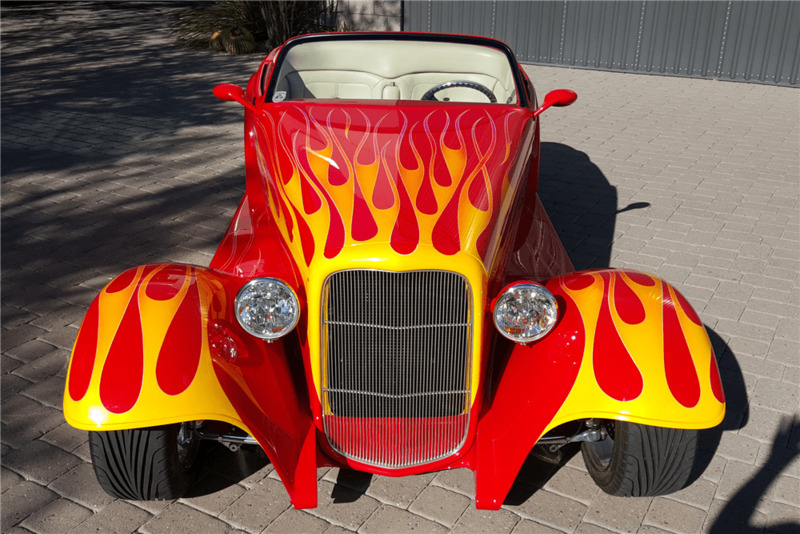 The car’s steel reinforced fiberglass body takes the classic design of a ’32 Ford roadster and adds numerous details. D.F. Metalworks stainless-steel grille presents flatter and wider than a tradition one and sits between two chrome-trimmed headlights with body-matched housings and integrated turn signals. The traditional hood was extended to accommodate massive power plants, giving the car that “long and low” look. A wraparound windshield trades in the traditional look of chopped and stainless-framed windshields for a smooth and clean-design custom look. Shaved suicide doors carry sport mirrors. 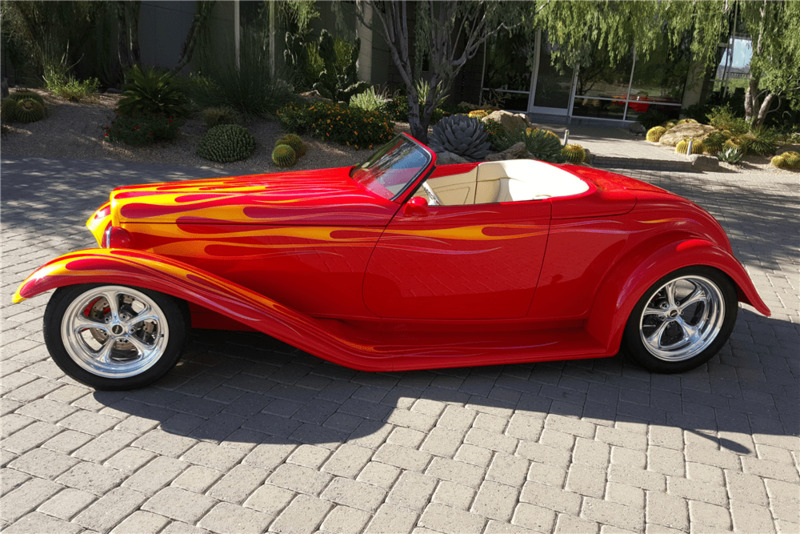 Custom-flowing fiberglass fenders give the traditional roadster body some nice modern curves. One-off custom hidden soft-top sits above a thin LED taillight that spans the width of the smooth rear valence. A completely retractable license plate hangs just above the ground in front of a finned rear-end cover and chrome inboard-mounted brakes. 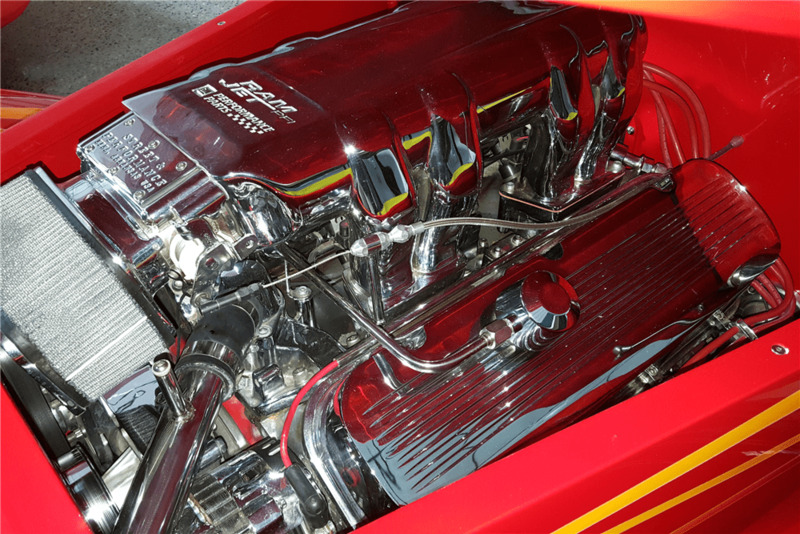 The GM Performance Parts Ram Jet 502 takes up the car’s entire Torch Red engine bay. This GM package includes high-efficiency aluminum heads, aluminum intake, forged aluminum pistons, forged steel connecting rods, forged steel crank, hydraulic roller cam, fully-calibrated ECM, electronic fuel injection and a stout 9.6:1 compression ratio. 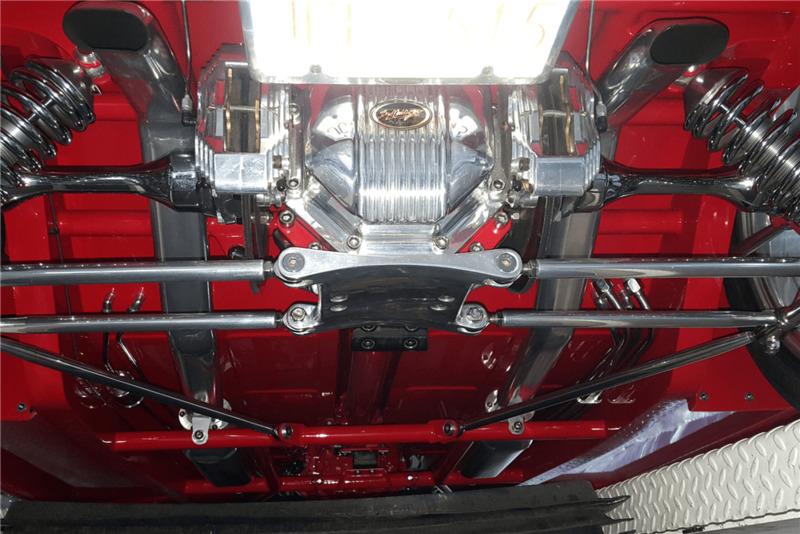 The custom-built frame was supplied by Boyd Coddington and consists of a heavily tapered chassis reinforced by tubular cross members. A polished Heidts-style front suspension has stainless-steel upper and lower control arms, chrome QA1 coilover shocks, Flaming River manual steering rack and Wilwood performance brakes with drilled rotors and chrome calipers. The independent rear suspension features inboard Wilwood disc brakes with polished calipers, two more polished calipers, two more polished QA1 coilovers and a finned differential cover. It has a custom-fabricated and polished oval exhaust system, including stainless Hushpower mufflers, and 6-speed manual transmission from an LT4 Corvette provides motivation with 3.73 gears. Everything under this car has been painted in Torch Red. It rides on 16″ front and 18″ rear, Boyd Coddington wheels with Z-rated Goodyear radials. 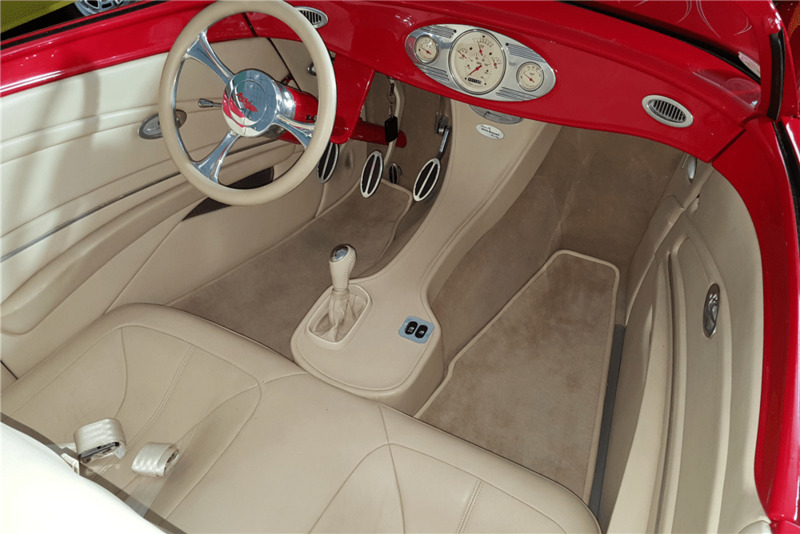 Interior is covered in high-quality cream leather; the bucket seats were custom-fabricated for this car. Also has air conditioning and power windows. ← Happy Holidays to you and Yours.